GeoPoll is a leader in providing affordable market research from areas that are difficult to access using traditional methods. Working with leading agencies, brands, and global media groups, GeoPoll facilitates projects that measure ROI of advertisements, demonstrate demand for new products, and assess customer satisfaction. GeoPoll’s mobile surveying capabilities and one-way messages are used by global health organizations, governments, and researchers to measure food insecurity, assess citizen perceptions of government, determine demand for digital financial services, and disseminate vital information. GeoPoll is the leading mobile surveying platform in emerging markets, with a database of over 240 million users and a robust multi-modal survey platform. GeoPoll has a staff of over 80 people with offices in Nairobi, Kenya, Washington, DC, Denver, Colorado, and additional staff throughout Africa. In March 2017, GeoPoll partnered with a coalition of leading organisations, including The Red Cross Society, Well Told Story (Shujaaz) and Organisation for African Youth to carry out two surveys in Kenya targeted at 2,000 youth aged between 15-35 years with the objective of identifying and measuring the issues that are most important to young Kenyans. Utilizing the survey findings, the organisations came together on May 3 to launch a nationwide campaign to offer support to these youth and to unite their voices in a campaign dubbed Ji-Activate. The social movement JI-ACTIVATE will run a series of forums, events and activities across Kenya in May and June to further understand the issues identified by the poll. The data collected at these events will inform the creation of a youth declaration, ahead of the Kenyan general elections in August 2017. The campaign aims to bring youth together on a unified and non-partisan platform, with a view to constructively engage policymakers. GeoPoll utilized randomized sampling techniques to collect 2,000 completed surveys—split evenly by men and women—through a nationally representative sample across all 47 counties in Kenya. The respondents were randomly selected from GeoPoll’s database of 8 million users in Kenya with 66% of the respondents living in rural areas and 34% in an urban setting. Fifty percent of the respondents had secondary-level education, 40 percent of whom had post-secondary education. Four out of every 10 respondents identified corruption and food security as the most important issues affecting Kenya. Healthcare and unemployment ranked as third and fourth. Other issues of concern included insecurity (16%), poverty (15%), high commodity prices (15%), and workers strikes (6%). These issues are not new to youth; when asked which issues affected them the most in the last two years, a majority of youth picked unemployment at 25% and corruption at 23%. Looking forward, youth identified unemployment—by half of all respondents—to have the biggest impact on their future, followed by corruption. In order to address issues affecting them, one-third (34%) of respondents noted that they post on social media. Others organize and/or attend events and sign petitions. 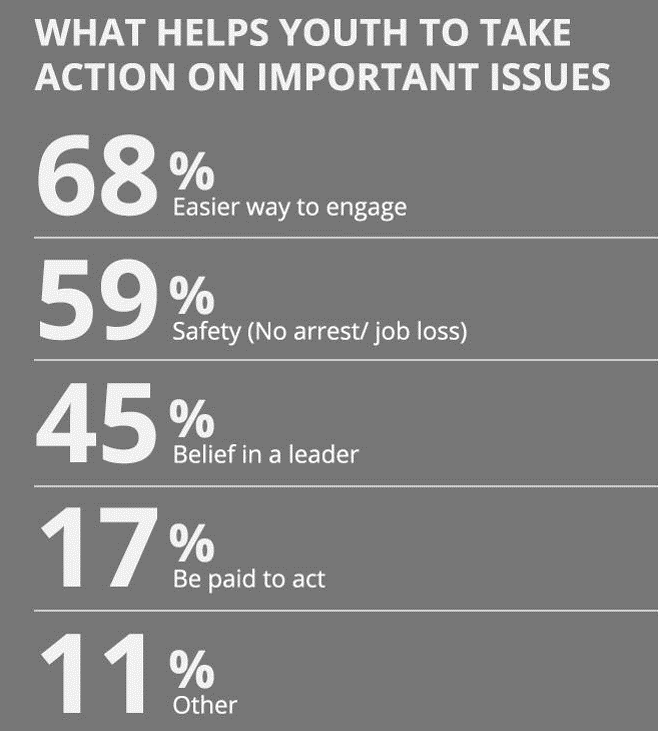 When asked why they might act, more than half of the respondents stated that the engagement means need to be easier. Others cited safety and motivation as key drivers; 59% identified safety while 45% indicated that a leader they believed in would help them act. Family is also a key motivator to taking action; 47% indicated that family motivates them to take action on the most important issues to them. The campaign formally launched on 3rd May.